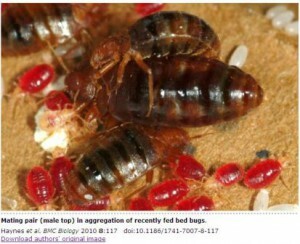 Female bed bugs must be fertilized by a male to lay eggs. The female only needs to be fertilized once every 6-8 weeks. She will lay eggs every day after fertilization – for weeks. Females will mate with any available male including siblings, children or parents. If you have a pregnant female she will mate with her male offspring as soon as possible and will continue throughout the rest of her bed bug life cycle. Females can continue laying eggs for up to 6-10 weeks without feeding. Temperature can affect how many eggs are laid and how frequently. Eggs can take from 7 to 15 days to hatch, depending on environmental conditions such as temperature. Baby bed bugs, also called nymphs will feed approximately five times before becoming an adult. 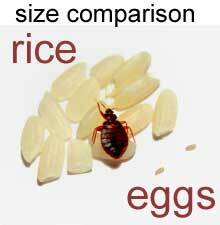 Newly hatched bed bugs can live for several months in ideal conditions without a first meal. Each meal (3-7 days apart) will be followed by a “molt” of their skin. Each time they molt, they evolve to the next size, until they reach adulthood. That is when females will begin to lay eggs if she can mate. When a female reaches adulthood she is ready to begin laying 2-7 eggs a week. Females can lay between 200 and 500 eggs in their lifetime. Bed bugs develop from egg to adult via a process called “gradual metamorphosis.” This means the last larval stage develops directly into an adult without passing through a non-feeding pupal stage. There are five larval stages, and each one requires a blood meal before molting into the next life cycle stage. Both adult male and female bed bugs feed on blood and take repeated blood meals during their lives. Females require blood for the development of eggs. The five larval stages are completed in about a month under suitable conditions of temperature, humidity, and availability of hosts for blood meals. Larvae can survive inside dwellings for several months without a blood meal, but they do not molt into the next life cycle stage until they engorge on blood. Adults can survive even longer under the same conditions, but, again, do not develop eggs unless they feed on blood. Male and female adults usually feed every 3-4 days and become engorged with blood in about 10-15 minutes. Bed bugs detect carbon dioxide emitted from warm-blooded animals and respond to warmth and moisture as they approach the potential host. On humans, they tend to feed on exposed surfaces such as the face, neck, arms, and hands. Again, the bites are painless, and the host typically is not disturbed while bed bugs feed. Not many pesticides labeled for bed bugs kill bed bug eggs, with the exception of Bedlam. So if eggs are trapped in sealed plastic garbage bags, probably not absolutely oxygen suppressed, and when they hatch, can they live for several months as nymphs without food? Also – I have kept bed bug eggs in a glued shut plastic container for a month and a half and they still haven’t hatched. Is this because they are either already dead, or they are lying dormant or dead without oxygen? Hi, sorry to be late in seeing this message. I’m not an entomologist so I’m not really sure, but…I “think” the eggs will either hatch or not. The nymphs (just hatched) can go some weeks without a first meal. How long is mostly moot. How is your infestation going?